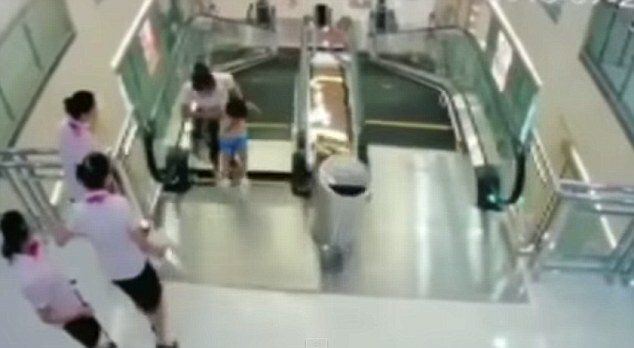 A mother was killed when she fell into an escalator at a shopping mall in China, after she heroically threw her toddler to safety. 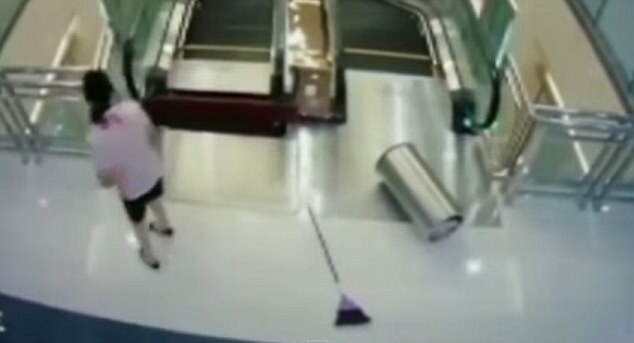 Xiang Liujuan, 30, was travelling up the escalator at Anliang department store in Jingzhou, in the central province of Hubei, with her two-year-old son. When the pair reached the top, however, a floor-plate gave way and the woman fell through the floor, as captured by CCTV. Seconds before falling to her death, the mother was able to thrust her toddler towards mall staff, who dragged the child to safety. Two staff members at the top of the escalator tried to help the woman, as half of her body dangled into the shaft above the machinery, but were unable to. The woman was shopping with her husband on Sunday when the accident happened, reported the Wuhan Evening News, although he was not with them on the escalator. Maintenance had just been carried out on the escalator, and initial reports claim workers forgot to screw the access cover back into place. 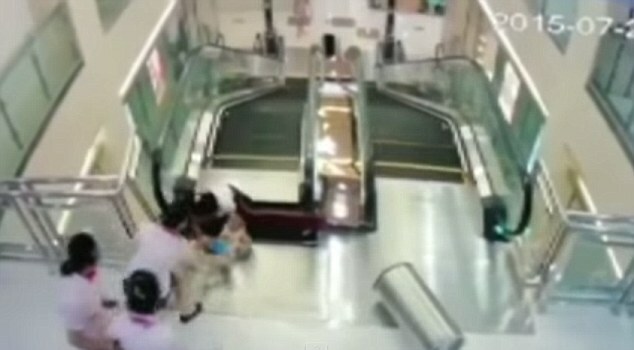 Rescue crews reportedly took four hours to remove the woman’s body from the escalator, which showed ‘no signs of life’. The accident was one of the top topics on China’s Twitter-like Sina Weibo on Monday with more than 6.6 million views. Most comments expressed fury at the shop management. Others were moved by the woman’s final actions. ‘I was appalled when I saw her sink and at the same time felt the greatness of maternal love – the mother wasted no time pushing the child out when it happened,’ said one. China is prone to safety accidents as regulations and standards are often flouted and enforcement is lax, sometimes due to corruption. 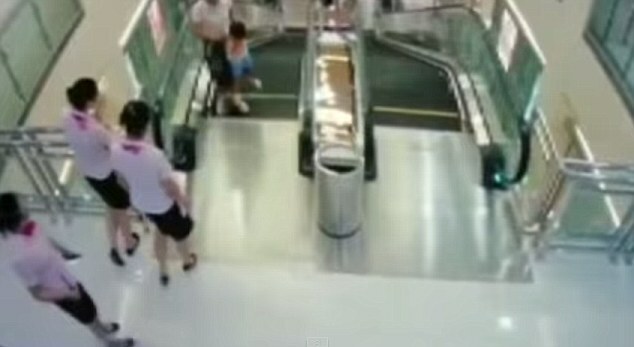 In 2012, a nine-year-old boy was killed after he got stuck in an escalator at a Beijing department store as horrified shoppers looked on. In July 2011, a 13-year-old boy was killed and more than 20 others injured when an escalator in a Beijing underground station suddenly reversed direction during the rush hour. where each college student or pupil can find ratings grade point average marks.